Alot of you have noticed your battlemode is all messed up and some of you are having trouble setting up hotkeys on the Renewal client. 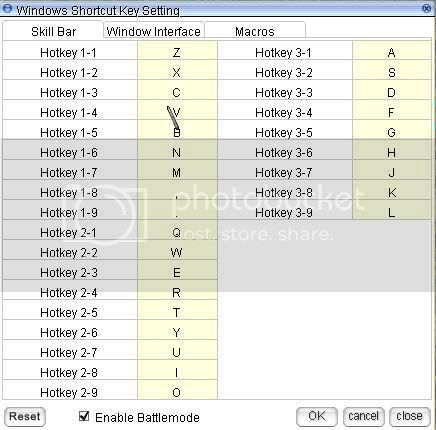 To setup the battlemode simply press esc until your logout menu appears. 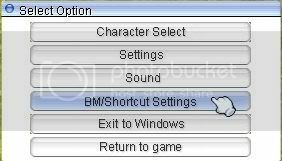 Click the "BM/Shortcut Settings" button and it will bring up a window that allows you to setup your hotkeys, here is a pic with the keys in the same layout as battlemode on the old client. Dont forget you can click the tabs at the top and change other things too, just do a little experimentation and contact a mentor or staff member with any questions. neither do i...i was going to ask rob about them and make this post cover the other tabs under that window but decided this would work. and still so much more to figure out..
ya there is alot more you can do with renewal client but this plus remembering to use enter instead of space to activate battlemode and you should be able to function, the rest is just up to experimentation. Even something as simple as setting alt+P to get to party setup took me a long time to figure out you could set by going into the window interface tab and set it. All of this is very simple if you spend a while figuring it out and messing with your options.